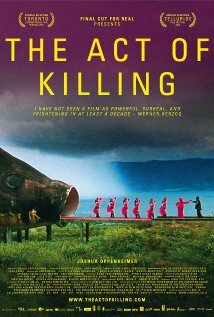 So, this is a documentary movie about Anwar congo and his friends who became a hero for killing more one hundred communist. They live as normal people and they don't get punished by their acts because they think that they do it for defending their country. They stated themselves as *free-man* and there is Paramilitary organisation that involved in the acts. Later, its revealed that Anwar and his friends had particular reason why he killed the people. In the movie, they manage to make a satirical comedy film about their experience. We will see many of interesting scenes about the progress of film-making besides their discussion along the movie about their feeling. There is one point that I take from the movie, a fact that is the action really to defend this country from communist influence or just personal revenge. And I know in each region has different excuses.